President Trump’s effort to track and prevent violence from undocumented immigrants has instead become a nightmare for domestic violence and human trafficking survivors, according to an advocacy group that helps immigrants suffering from abuse. As the Los Angeles Times reported in April, DHS-VINE—launched in June as part of Trump’s Victims of Immigration Crime Engagement Office—is a searchable database of detained immigrants and, controversially, asylum seekers. It purports to highlight crimes committed by undocumented immigrants; it drew controversy upon launch, as the Times report included accounts of children as young as three years old who ended up in the public database. Now, as Buzzfeed reports, the Tahirih Justice Center says the database has also revealed the identities and locations of vulnerable populations. Immigrants listed in the database include those who have applied to stay legally in the US as victims of domestic violence, sexual assault, and human trafficking under the U or T visa program and the Violence Against Women Act, the Tahirih Justice Center found. But under federal law, DHS is generally prohibited from releasing any information about immigrants applying for these protections to third parties. “When an abuser or a trafficker or someone else is interested in finding out where that individual is being detained, and when that person is released, they can now find out that information,” Pyati said. While DHS previously blamed an erroneous “lapse in policy” for the release of information about children—and supposedly fixed the issue—the names of abuse victims were still searchable in the database as of this week, according to the Tahirih Justice Center. The organization has called for DHS to either censor VINE to protect victims’ information or disable the database altogether. The Victim Information and Notification Exchange is an automated database of everyone in U.S. Immigration and Customs Enforcement custody. It was purportedly created to alert victims of crimes by undocumented immigrants when their assailants are moved to new facilities. According to LA Times, the database includes “the detention facility the immigrant is housed in, custody status, age, country of birth, date of birth, race, gender and aliases,” and even the day they’ll be released. Because being undocumented is itself a crime, undocumented women can be detained after going to women’s shelters for help, thus ending up in the database. There’s also no distinction between being arrested for a crime versus being charged with one. 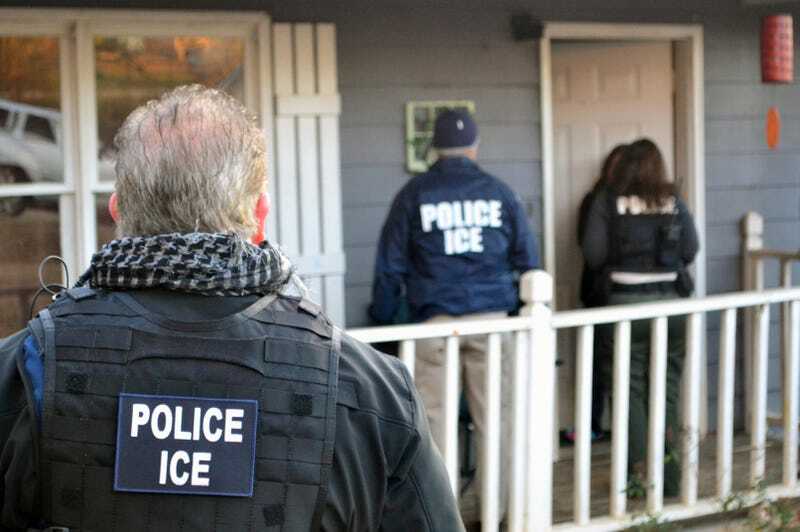 Immigrants arrests are up 40% under the Trump administration, largely because ICE has been stepping up the arrests of immigrants who aren’t committing crimes. With VINE, that means non-violent victims of crime are detained, released, and outed to abusers. An ICE spokesperson provided the following explanation to Buzzfeed; we’ve reached out for further detail, and we’ll update if we hear back.